Bird-cherry small ermine (Yponomeuta evonymella), a moth found throughout Europe and most parts of Asia. A group of micromoths has evolved the ability to produce a clicking sound with its wings to ward off insect-eating bats, its main predator. But because these moths are deaf, and therefore cannot produce this anti-bat sound only when they are under attack, they produce their anti-bat sounds continually, but in such a way that it doesn’t attract hungry bats. 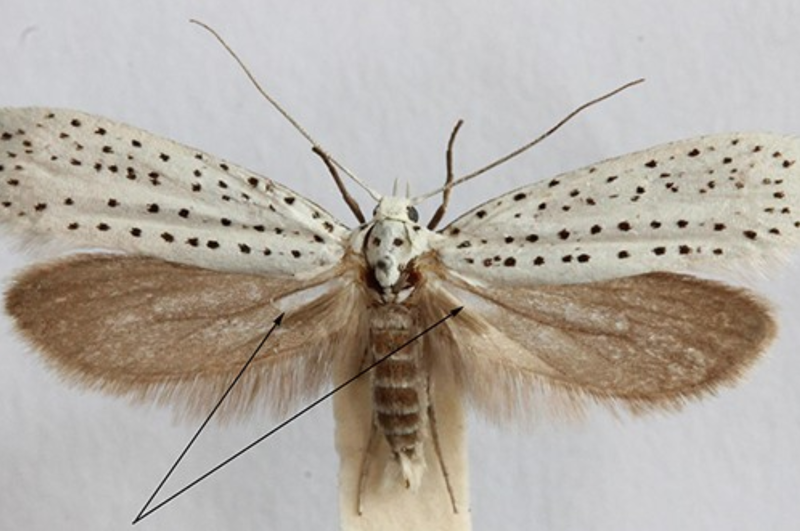 A team of researchers at the University of Bristol and the Natural History Museum discovered that small ermine moths in the genus, Yponomeuta, have ridges on their hindwings (arrows; Figure 1). When these moths fly, the hindwing ridges bang against the air, producing a continual series of clicks that warn away hungry bats (ref). 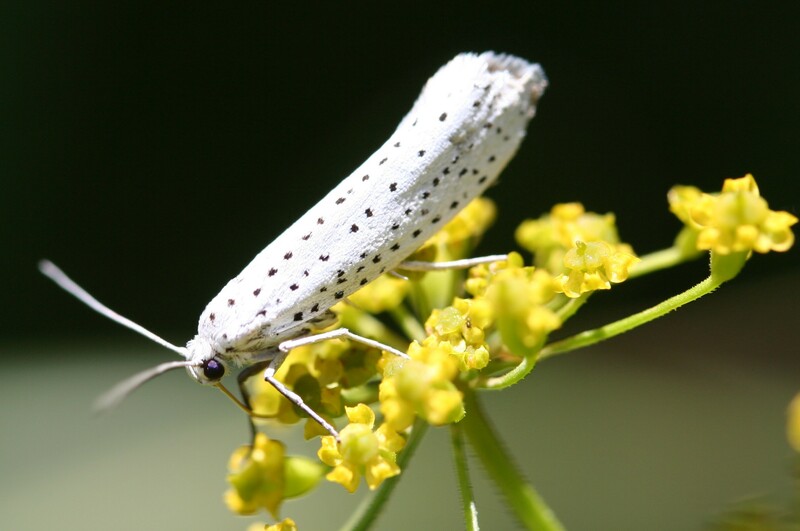 Figure 1: A bird-cherry small ermine moth (Yponomeuta evonymella). The arrows indicate the hindwing tymbals. Producing ultrasound is a common defensive strategy against bats employed by several moth taxa, but there are a number of ways sound is used. For example, many larger moth species’s hearing is specifically tuned to hear approaching bats’ echolocation calls, and immediately upon hearing such calls, the moths respond by performing evasive mid-air maneuvers. Other moths have long hindwing tails that produce decoy echos that create false targets, so the bats preferentially attack the moths’ hindwing tails. “Bat defences in larger moths are well studied, however, the defences in smaller moths are not,” said lead author Liam O’Reilly, a PhD student at Bristol’s School of Biological Sciences. The genus, Yponomeuta, includes 100 or more species of moths that range in size from super-tiny to medium-sized moths, most of which fly at night. These moths are poorly known (because they are so small), but one characteristic that they all have is a translucent patch that is devoid of wingscales at the base of their hindwings. It was originally proposed that this translucent patch may produce sound so the moths could evade attacks by bats, but no one knew if this was the situation because the acoustic arms race between any of the micromoths and their bat predators has not been investigated before. Mr. O’Reilly and his collaborators investigated the significance of the Yponomeuta micromoth species’s translucent wing patch and identified the acoustic properties of the sounds it produced. Figure 2. Hyaline (translucent) patch of Yponomeuta (A) Yponomeuta evonymella exposing the hyaline patch on its hindwing (in white box; see B). (B) Scanning electron micrograph (SEM) of the ventral side of the hyaline patch (white box corresponds to that in A), with the striations numbered from left to right and the Cu1b and Cu2 veins labelled. The researchers found that the Yponomeuta species’s striated wing patch is strikingly similar to arctiine moths’ thorax tymbals that produce their anti-bat sounds. Arctiine moths’ tymbals are small areas of cuticle on their body, backed by an air cavity, that is connected to a dedicated muscle. When the muscle contracts, the tymbal becomes warped, producing a click, then when the muscle relaxes, the tymbal snaps back to its resting state, producing another click. But the small ermine moths’ translucent hindwing tymbals are not connected to a muscle, so it is not clear how they produce sound. Figure 3. Synchronisation of click bursts with wing beats in Yponomeuta evonymella. (A) Spectrogram and waveform showing an example of the two bursts of ultrasonic clicks produced during one wingbeat. Red and blue boxes represent the frequency range of arctiine anti-bat sounds and the hearing range of Eptesicus fuscus (an insectivorous bat) respectively. Yponomeuta moths’ sounds closely mimic those produced by arctiine moths (Figure 3). And similar to arctiine moths, Yponomeuta moths also sequester toxic compounds that make them taste terrible, indicating these two different groups of moths converged upon the same defensive form and function — a noxious taste that’s poisonous, accompanied by an acoustic warning to bats that they are poisonous. Thus, the researchers concluded that these moth taxa are mutual Müllerian mimics. Müllerian mimicry is a form of mutually beneficial convergence between two or more species that are harmful to other animals. “Many animals use a conspicuous visual signal such as bright colouration to warn their predators of a defence, but at night, an unpalatable moth cannot provide a bat with a visual warning signal, so instead it warns its predator acoustically through a clear sound — loud high frequency (ultrasonic) clicks,” Mr. O’Reilly explained. But the big difference here is that small ermine moths are deaf, so they cannot hear approaching bats’ ultrasonic calls and take evasive action by initiating clicking. Instead, Yponomeuta species constantly produce ultrasonic clicks as they fly whilst their wings rotate and bend in the air. How do the moths avoid hungry bats associating their warning clicks with the ringing of a dinner bell? The small ermine moths produce sounds can only be heard over the distance that bats normally hear echos produced by their own echolocation calls, so the bats hear the moths’ acoustic warnings only after they become aware of the moths’ presence. Because these moths’ clicks sound like those produced by another group of terrible-tasting moths, the bats avoid eating these, too. Already, Mr. O’Reilly is collaborating with material scientists to find out the exact mechanism by which the small ermine moth tymbal produces sound. Originally published at Forbes on 17 March 2019.